October 19, 2009 Cafe Scientifique: Kip Thorne, "The Warped Side of the Universe"
October 21, 2009 Kip S. Thorne, California Institute of Technology, "The Warped Side of the Universe: From the Big Bang to Black Holes"
Cafe Scientifique: Kip Thorne, "The Warped Side of the Universe"
Our Universe has a "warped side": objects and phenomena that are made not from matter, but rather from warped space and warped time. Examples include black holes, and the big-bang singularity from which the Universe was born. Thorne will discuss this mysterious warped side, the quest to simulate it using supercomputers, and the quest to observe it using gravitational waves and strange telescopes. 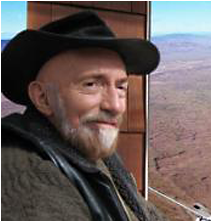 Kip S. Thorne, California Institute of Technology, "The Warped Side of the Universe: From the Big Bang to Black Holes"
Born in Logan Utah in 1940, Kip Thorne received his B.S. degree from Caltech in 1962 and his Ph.D. from Princeton University in 1965. He returned to Caltech as an Associate professor in 1967 and became Professor of Theoretical Physics in 1970, The William R. Kenan, Jr., Professor in 1981, The Feynman Professor of Theoretical Physics in 1991, and The Feynman Professor of Theoretical Physics, Emeritus, in 2009. Thorne's research has focused on Einstein's general theory of relativity and on astrophysics, with emphasis on relativistic stars, black holes and especially gravitational waves. He was cofounder (with R. Weiss and R.W.P. Drever) of the LIGO (Laser Interferometer Gravitational Wave Observatory) Project, with which he is still associated. He is a member of the LISA (Laser Interferometer Space Antenna) International Science Team. Thorne was elected to the American Academy of Arts and Sciences in 1972, the National Academy of Sciences in 1973, and the Russian Academy of Sciences and the American Philosophical Society in 1999. He has been awarded the Lilienfeld Prize of the American Physical Society, the Karl Schwarzschild Medal of the German Astronomical Society, the Albert Einstein Medal of the Albert Einstein Society in Berne, Switzerland, the UNESCO Niels Bohr Gold Medal from UNESCO, and the Common Wealth Award for Science, and was named California Scientist of the Year in 2004. For his book for nonscientists, Black Holes and Time Warps: Einstein's Outrageous Legacy (Norton Publishers 1994), Thorne was awarded the American Institute of Physics Science Writing Award, the Phi Beta Kappa Science Writing Award, and the (Russian) Priroda Readers' Choice Award. In 1973 Thorne coauthored the textbook Gravitation, from which most of the present generation of scientists have learned general relativity theory. Fifty-two physicists have received the PhD at Caltech under Thorne's personal mentorship. 2009-2010 Brinson Lecture: "The Warped Side of the Universe: From the Big Bang to Black Holes"
Our Universe has a "warped side" -- objects and phenomena, like black holes and the big-bang, that are made not from matter, but rather from warped space and warped time. Thorne will describe this mysterious warped side and the quest to simulate it using supercomputers and observe it using gravitational waves. This event is co-sponsored by the University of Chicago and the Adler Planetarium. In May during the Hubble Space Telescope (HST) servicing mission, John Grunsfeld, SM'84 PhD'88, paid homage to fellow UC alumnus Edwin Hubble, after whom the telescope was named. Hubble, an astronomer whose seminal contributions to the field greatly expanded our understanding of the Universe, also played forward on the Maroons' Big Ten champion basketball teams of 1907-08 and 1908-09. In May of 2009, the Hubble Space Telescope's last service mission successfully upgraded and repaired the telescope to include new cameras and instruments. During the 12 day mission in orbit, the Hubble Servicing Mission 4 (STS-125) performed 5 spacewalks to complete the upgrades so that the telescope could begin a new journey of discovery. Join us for a discussion with Astronaut John Grunsfeld who will describe the adventures of working in orbit on the Hubble Space Telescope and the exciting scientific results that the new instruments provide.